We've been so excited about partnering with Whole Foods for their Local Foodmaker Grant-- a new project they're trying this year for their annual 5% Giving Day-- and loved the opportunity to go out today and support the local food producers in our community! Today only, 5% of the sales from Northern California Whole Foods' will be given as grants to local food producers selected by the community. Working Solutions will help distribute the grant money to the recipients. 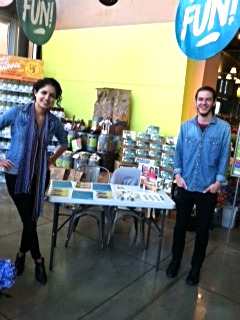 Today, we set up shop in Whole Foods Markets from Mill Valley to Oakland and San Francisco. Congratulations to all the grant recipients (you can read about them all here)-- we look forward to working with you! The Business Services team takes Oakland! Working Solutions celebrates the launch of the Marin Loan Fund!